Art reflects the constant evolution of society in humanity. Through the centuries, man endures a natural progression of knowledge. Trends in artistic expression come and go. One facet of art content that has remained is symbolism. From Prehistoric caves to Medieval castles symbolic ideologies have been present. Religious symbolism is the most common form of signifying art in history. Both the High Renaissance and Baroque art periods feature substantial examples of these forms of iconography. The High Renaissance was prevalent during the sixteenth century in Europe (Stokstad 2002). This period in art history was often called the rebirth� of classicism. There was much focus on both Greco-Roman antiquity as well as the humanistic movement. Religion played an important role in the social and political aspects of life. These issues promoted religious artworks, thus evolving religious symbolism. While there were many extraordinary paintings and sculptures during the High Renaissance, several works of art stand out because of there striking use of symbolic meanings in art. 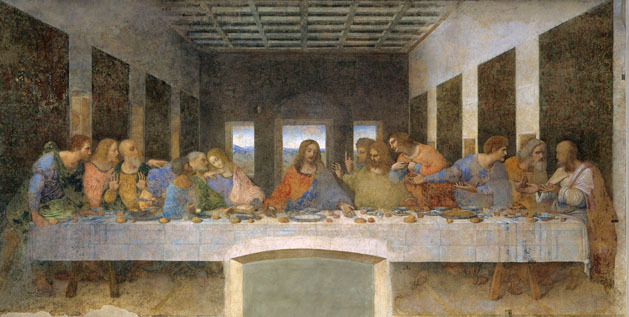 The most famous of these works is Leonardo da Vinci's The Last Supper. Created between 1495 and 1498, The Last Supper actually is part of fifteenth century art, yet the form and technique unify it with the High Renaissance period of the sixteenth century. One of the most common practices of religious symbolism is the halo which usually adorns the head of a person considered divine.� While this tradition ended for the most part in the fifteenth century, da Vinci uses both linear and atmospheric perspective to highlight the head of Jesus, whom is seated in the center of the table, with natural sunlight. This effect still reminds the audience, even if it is subconscious, that Jesus is divine. Though this is the most obvious symbolic feature, there are several more aspects of the painting which signify certain meanings. Marilyn Stokstad mentions other symbolic parts to the painting saying, "The Last Supper is a symbolic evocation of both Jesus' coming sacrifice for the salvation of humankind and the institution of the ritual of Mass" (qtd. in Stokstad 2002). By looking further at the painting, one may notice that the disciples are arranged in groups of three. This alludes to a symbolism of numerical, medieval tradition. Another piece of High Renaissance art is the carving of Annunciation and Virgin of the Rosary. It was created by Veit Stoss, a German artist who was known for his use of limewood sculpture. He painted the art work and added gilt to it as well. The piece depicts a scene where the angel Gabriel tells the Virgin Mary that she will give birth to Jesus Christ. Both Gabriel and Mary are surrounded by angels which promotes the idea of a divine revelation. The entire scene is surrounded by a wreath of roses which symbolizes the rosary, prayers to the Virgin Mary. Matthias Grunewald was another German artist who created meticulous works of art which contained many allusions to symbolism (Stokstad 2002). Grunewald made the Isenheim Altarpiece from 1510 to 1515. He used mediums of oil on wood panel. The altarpiece consisted of several panels which opened like a storybook. Depending on certain holidays or times of the week, the altarpiece would reveal specific scenes of the life of Christ. His artwork benefited from the use of the canon of proportions as well as his realistic depiction of the suffering which Jesus Christ endured. One panel of the altarpiece vividly depicts the crucifixion of Christ. It is highlighted by a lamb which is shown at the foot of the cross. It is holding a cross with its ankle and is bleeding from its chest into a gilt goblet. This image signifies the Christian traditions of baptism and communion. It also reminds the viewer that Jesus Christ is the Lamb of God. Another panel features the divine birth of the Christ child. This is in direct contrast of the startling depiction of the crucifixion, yet it offers many examples of symbolism in the panel. There is a glass cruet of water, white towel and garden; each of these ideals allude to Mary's virginity. A fig tree is also shown which symbolizes the Virgin Birth because figs were believed to grow fruit without being pollinated. One last symbolism in the Isenheim Altarpiece is a red rose bush. While it usually signifies Mary, it also suggests the crucifixion of Christ. Renaissance art was generally focused on the revival of Classicism. The Baroque period of art of just the opposite. Spanning from the late sixteenth century to the eighteenth century, the Baroque period of art of was highly naturalistic, even though there was a great emphasis on drama and grandeur (Stokstad 2002). Other essential components of this art period where time, space, and light. Many artists attempted to incorporate these features into their works. One piece of Baroque art which effectively used light to enhance its appeal was the Baldacchino. It was created by Gianlorenzo Bernini from 1624 to 1633 (Stokstad 2002). The Baldacchino served as a backdrop for the altar of Saint Peter's Basilica and was commissioned by Pope Urban VIII. It is a breathtaking combination of both sculpture and architecture. It features a high canopy of twisted columns which covers The Chair of Peter, a shrine to the martyred saint. The columns themselves offer religious symbolism because the twisted marble columns refer to the New Testament and the Old Testament of the Holy Bible. Peter's throne was made of stucco, bronze, and gilded stone; it symbolized the direct descent of Christian authority from Peter to the current pope (qtd. In Stokstad 2002). One example of the naturalistic movement is shown in Jan Vermeer's painting Woman Holding a Balance (Stokstad 2002). Again the use of lighting plays an important part in this painting as it highlights the subject. Made in 1664, this genre scene, a popular trend of the Baroque period, appears simplistic; but the theology is much more complex. Behind the woman is a painting of the Last Judgment. This painting in the background combined with the balance alludes to man's everyday battle with good and evil. Woman Holding a Balance reminds the viewers that there are eternal consequences for their decisions. Another emerging style of the Baroque period was the use of landscapes. Combined with the naturalism movement, this type of painting became very traditional during the seventeenth century (Stokstad 2002). Nicolas Poussin was the painter of Landscape with Saint John on Patmos. Using oil on canvas, Poussin created this painting in 1640. It depicts Saint John as he is writing the Book of Revelation among natural elements. An eagle is shown near Saint John which is his personal symbol. Most saints were given symbols which reflected there life. It allowed the audience to understand the subject matter much easier. Religion is such an important part of society. Without the world would probably be much more chaotic and disorderly. People rely on their faith during hardships in their life. This is why religious art and symbolism are so important. They help enhance and strengthen the faith of believers. Art will continue to progress as long as man exists. It is important to study the history of art and the long road that it has traveled. If art history was not studied, no one would appreciate how much man has evolved.